It was early in the morning this week and as I talked on the phone I look out my second story office window. There in the pine trees I a spotted a clumsy crow jumping around. I got so excited that I had spotted my first baby crow of the season. He was playing in a little crow way but he wasn’t really that little, he is almost the same size as his parents. He had found some nut or seed in the tree and held in his beak. He wouldn’t let it go even when his parent came over and started to groom him. 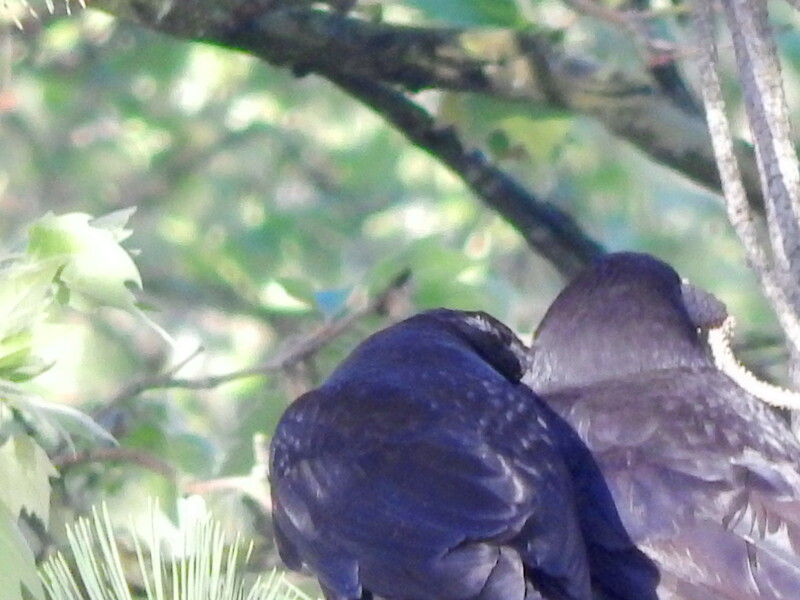 It is a common question – how do you recognize a baby crow? I have written several articles about them and pointed out the tell-tale clues, which are blue eyes, pink mouth, pink mouth corners and clumsy behavior. They are rather silly, naïve and need education. Another key sign is their feathers are not shiny black and seem brown. Morning light coupled with being right next to his parent gives us a perfect look at his drab baby feathers. Hope you get to see a spring baby crow or bird this year. In the meantime, enjoy these photos. We should be seeing baby crows shortly, a pair of crows has a nest going close to us, so we’ll be keeping an eye out for the youngsters when they leave their nest.